You might be tempted to pick up the text of each chapter and copy and paste it into one document. That can lead to issues and inconsistencies. This is the correct way to do it and actually takes less time and avoids you leaving out any bits of your individual chapters. How do I prepare to combine my documents? The file names must be in the order that the chapters are going to be in. 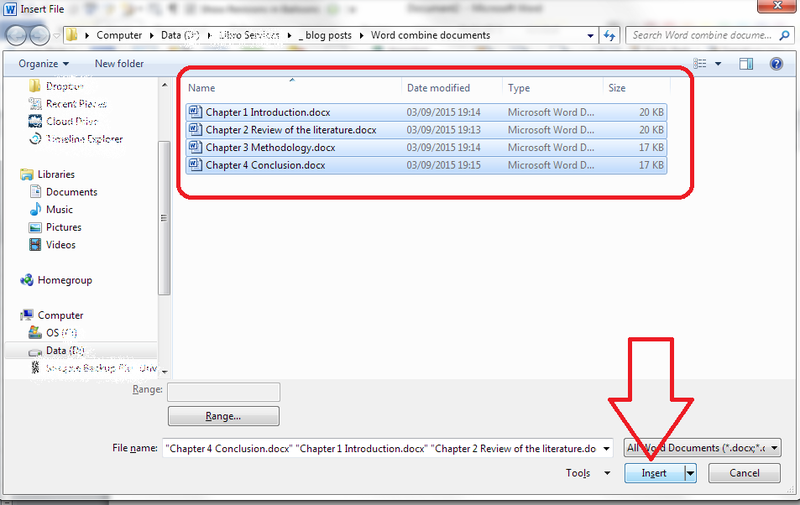 Word will combine your chapter files in alphanumerical order. then that’s fine, they will combine in that order. when it combines your documents. The best thing to do is add a number 1, 2, 3, etc at the start of your file names BEFORE YOU START COMBINING, so you know they will come out in the correct order. How do I combine my documents? OK, so we’ve got, say, four documents or chapters to combine into one. Now navigate to your files and select the ones you want to combine. Hold down the Control Key and click on all the ones you want to combine (or click on the top one, hold down Shift and click on the bottom one if you want all of them). Once you have them all highlighted, click Insert. Note: it doesn’t matter what order you are displaying them in or what order you click them in, it will choose them and insert them in alphabetical or numerical order, as I mentioned above. Now you will have one big document including all of your chapters! And … if you had footnotes in the documents, and had set page numbers to show, they will automatically update in the combined document to be numbered consecutively (if you want start your footnote numbering at 1 for each chapter, you’ll need to look at my posts on footnotes and endnotes). Don’t forget to save your document! 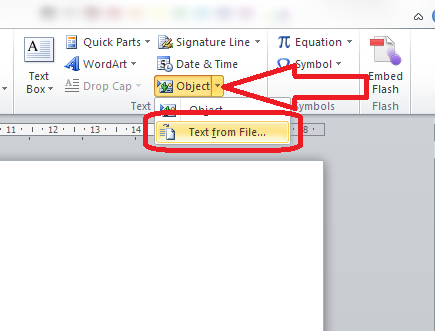 PS: If you find you lose your formatting when combining Word documents, read this article for the solution. Why not use Master documents? It is indeed a good idea to use Master and Subdocuments, however I like to first list the most simple ways that people can do things correctly (rather than copying and pasting, for example) and then move on to more complex ideas – many people are worried enough about combining two document without going into heading levels and Master documents. But it is a topic I will cover later on. Reblogged this on Erin Willard, Copy Editor. Glad you liked it, and thank you! I just loved it. The post on the alphabetical order of bibliography was amazing. I am just playing around with word and getting the exact results..
How would you go about leaving the page numbers in each document as they are, instead of them running consecutively? For instance, I want to combine three documents into one, but I want to maintain the page numbers of each document. I want my second document and third document to each start with the pages numbered 1, in my one combine document. To do that, you’ll need to add section breaks between each document in the combined document, then start the page numbering at 1 (or whatever) after the section break. Thanks for posting! Any clue on automatically updating the “combined”-file when making changes in the separate chapter-files? Thank you for your question. I don’t think you can auto-update like you can a linked Excel file; I think you would have to recombine once changes were all made, or make changes in the combined file. What determines the maximum number of files you can combine at one time? I’m afraid I don’t know the answer to this, and I can’t find an answer, either. One day I’ll try to combine hundreds and post about it. In the meantime, I’ll leave your question up in case anyone knows the answer! This is great info, Liz. I use Word all the time and have never tried this. Thanks, Eva, glad you found it helpful! 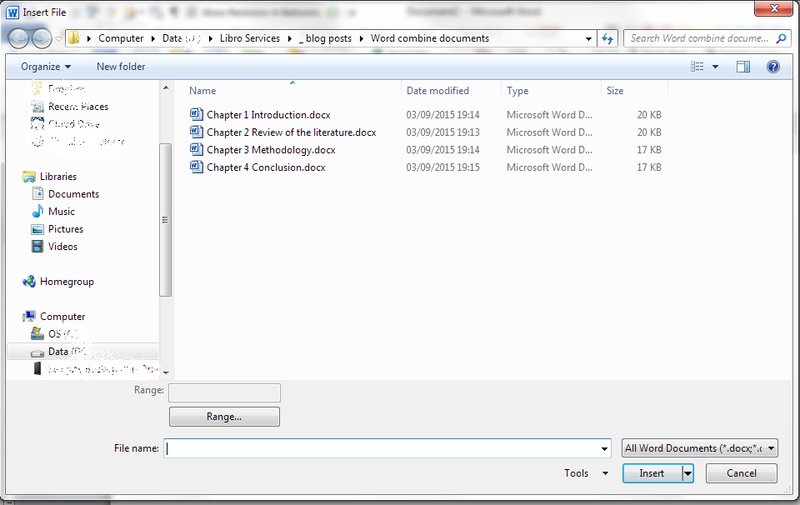 I’m having trouble maintaining my Chapter # – Page # format (in footer) when combining chapters. I have next page section breaks at the end of each chapter, and my Chapter #’s are linked to Heading 1, Level 1 in a multilevel list. But when I combine, all the Chapter numbers in my footer change to the first chapter number. Footers are not linked. Any ideas? But what about “preserving the Formatting” of each (previously separate) Section? The MS “Insert Object” feature specifically states “Text from File” (nothing about *formatted* text! I can report that I’ve done this recently with a client’s two sets of chapters and they retained their formatting; they didn’t turn into .txt style unformatted text documents. I hope that helps! Worked well for me merging 36 completed 2-page forms into one appendix document for a report. Thanks for the tip. Thanks for this advise. I am running MSWord on a Mac version 15.33. When I use the Insert > Object > From File. Only the first page of the selected file is visible in the new document. When I double click on the page it opens the source file. How do I get all the pages of the inserted file to appear in the new document? I’m sorry, as it should say on this blog post, I am only experienced with and write about Word for PC. But I’ll leave your comment up here as quite often other people answer people’s questions on the blog! We have a slightly different problem – we have a very large book published in a few separate parts. When we merge the final product, everything is FINE except procedure numbering. This is a User Guide with literally hundreds of procedures. Each Procedure is introduced with a Procedure Heading line, followed by numbered steps. When we merge multiple documents, the procedure numbers ALL become Continue from Previous – the numbering runs up into the thousands! Someone has to search through ALL those pages for each Procedure Heading style line, select the first numbered item after it,and manually set it to restart at 1. Does this sound familiar? Any advice? We could just select all content in each book and convert the field codes to plain text, but then we can never edit or update it, and the ToC is destroyed. I’m afraid that’s beyond my scope, too, but I’ll leave it here in the hopes someone drops by to help out. I am working on a book. Each chapter is a separate file. You’re guidance on assembling them is very helpful. Thank you. Can you help me with creating running chapter titles that will appear in the combined manuscript? Is there a way to tag the title in the chapter files for automatically creating a running chapter title after the manuscript is assembled? Ditto re creating a table of contents? Thank you! At the end of dissertation writing and revising, I don’t want to get caught up with unnecessary time and energy drains. Your solution for merging multiple docs in Word 16 doesn’t work on my version, because using the CTRL or SHIFT won’t select multiple docs as it does anywhere else in Word. have you come across this problem and is there a cure? Ian – I have checked with a few colleagues and here’s the answer. When you are inserting several documents into one document to combine, for example, chapters, you can choose as many as you want using the CTRL and SHIFT keys. If you are using the Combine feature that allows you to combine two documents based on the same text and their changes to make one document, you can only combine two at a time so won’t be able to select multiple documents. I have a question–something I’ve never dealt with. I have a client that sent me a large set of files, and I was concatenating them to analyze the file (for conversion to eBook). I used the insert–>Text from File method, which I’ve used for years. However, several of the files had chapter notes (Endnotes for a chapter). If you place your cursor in the end of the body text, then the endnotes move, past the end of the newly-inserted text, which is a different chapter. If you place your cursor at the end of the document, then, you’re inserting text into the footnotes/endnotes, not the body. How is this done? Or–is it simply not done, and somehow, done manually? I can honestly say, after decades of using Word, this one stumped me, and NO online tutorial discusses it (probably for the obvious reason–there’s no good way to handle it). Hm, did you combine all the documents into one new empty document, using the method described here, or did you have one document already open and insert the others into it? What happens if you combine them all into one brand new document all at the same time? So–I don’t see how the method of concatenation would matter. I don’t particularly want to combine them simultaneously, b/c no matter what you do with numbering, it doesn’t always work. I can try it, but I suspect the same issue remains. Ah, I see. I only ever do all the documents in one go, as I’ve never had anything but horrendous messes doing some and then some more later on, as you are doing. When you say it doesn’t always work, do you mean they don’t always go in together in the correct order? I’ve not had that happen but that’s not to say I don’t think it could. I can’t see where you could place the cursor where it would work if you’ve got footnotes etc., as you’ve tried both the options. The only thing I can suggest is doing it all at once and just seeing if that works, as it can’t claim then to be obeying where you’ve placed the cursor and being “helpful” as Word inevitably tries to be. Sorry I can’t give you a definitive answer. I would like to know what happens if you do them all together, but who knows what will happen, really. I’ll leave these comments up as sometimes people happen by years later and answer a tricky question. I’ve done a search but all I’ve found is my own article! I have the same problem and have found no solution. 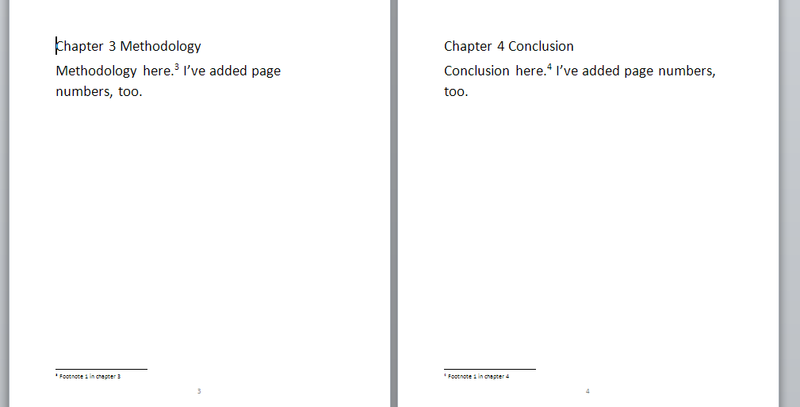 Using end notes at the end of each chapter seems impossible. I hope someone has an idea. None of the ideas I have found worked and I have puzzled over this for a day or two. This did work for me, so I am answering my own post. Convert all the endnotes in each chapter to footnotes. To do this choose references, footnotes choose convert, pick the endnote to footnote choice and fill in the blanks with the right format. Add section breaks using the previously described method. Combine all the chapters using the previously described method. Convert all footnotes to endnotes using the references, footnotes choose convert method, but now in reverse. I am using Microsoft Office Professional Plus 13. Thanks Don, I was going to to come in to suggest this but by the time I’d done that, here was your comment. I’m glad you confirmed it works, too! I have just tried this – sounded great – thank you. But I lost all the formatting! There are pictures and unusually formatted text – all gone in the new doc. Any suggestions? I’m trying to combine 18 chapters in a workbook for a course I run. Thank you for your question, Sally. Formatting in Word is tricky. One possible solution I’ve found is to insert a section break at the end of each of your documents before you combine them, as Word *should* then retain the formatting in each section. Can you give that a try and let me know if it works, as I can add it into the article if it does and I don’t have a suitable practice text right now myself? Hope that helps! Thanks so much Liz – that did the trick! It worked amazingly well – just needed to tweak a few bits that didn’t quite keep the formatting, but 99% of the document retained it exactly. It was fantastic! Thanks! Fabulous – thank you so much for reporting back! I might add it to this post or write a new one so people can find it easily. And I’m glad I could help! Hi Liz. This is good info. Thanks. I just finished “proof-writing” an Upwork client’s sixteen individual chapters and thought I was finished. Now she wants me to merge into one document and I know this can be dicy. They do not have page numbers yet and the chapter number begin with chapter 1, without the Introduction having a number. So, IF I decide to do it (and she provides additional financial incentive, lol) would I have to go back and edit all the chapters from the Introduction on with numbers? Any yes, formatting is another concern. I use WPS Writer by the way, bcs Microsoft kept asking me to pay to continue with Word. If the chapter numbers have a heading style it should work, however I’m only familiar with Word so can’t comment on WPS Writer. You can buy one-off versions of Word, I have a subscription but you don’t have to have one.